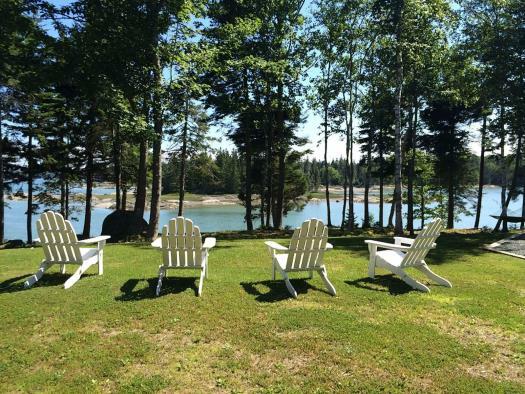 Situated on the shore of the Penobscot Bay, the Gase Cottage is the quintessential Maine summer home. 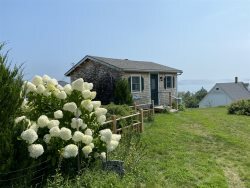 The cottage is oriented towards the ocean and has western exposure to capitalize on some of the most glorious sunsets in Midcoast Maine. 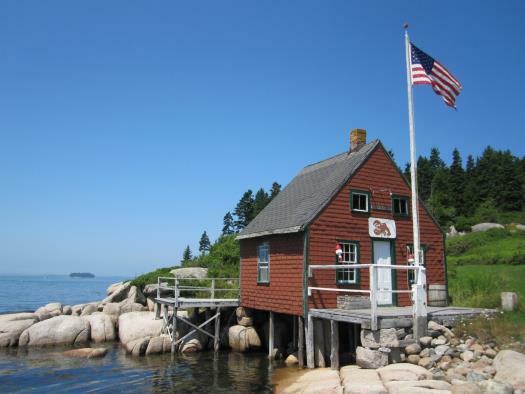 Gase Cottage is a one bedroom, one bathroom home. The cottage has hardwood flooring, cathedral ceilings and glorious views from almost every window in the home. The kitchen has a gas range and many of the small appliances such as a blender, toaster and microwave making it easy to prepare most any meal from the comfort of home. Gase Cottage has a shared living and dining room which is also open to the kitchen. The front of the cottage faces west with a wall of windows bringing the view from the outside in. 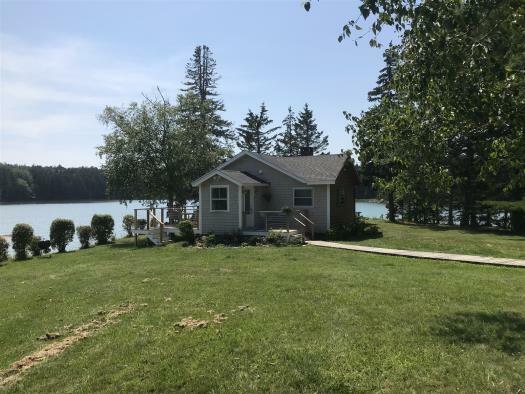 The one bedroom is on the first floor of the cottage and has french doors that open to the wrap-around deck. The bedroom also has a closet and a dresser. 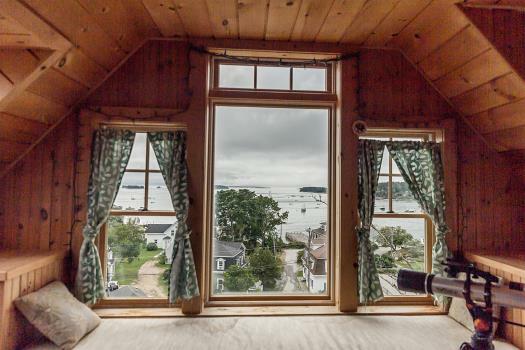 The bed is situated to the views of the bay. The full bathroom is also located on the first floor of the cottage and is adorned with a classic claw-foot soaking tub. Gase Cottage has a washer and dryer off the kitchen area making this a great one level living option. The second floor of the cottage is an easily accessible wrap around sleeping loft. The loft in the cottage has a west facing room with a queen bed. The sleeping loft is divided in to two sections, one side is bedroom inspired and the other side is a lounge with comfortable seating. There is a sleeper sofa in this area making the cottage comfortable for up to six guests. Gase Cottage has a nice yard with lush green grass which is bordered by tall pines, birches and decades old stone walls. A wrap-around deck with patio furniture and a gas grill. 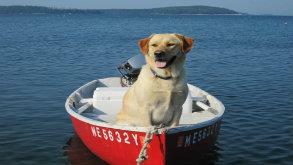 The cottage has a private setting with shared ocean frontage and a gravel beach on the shores of the Penobscot Bay. The water access is deep water and there is a nice rack on the shore for guests to store their water equipment near the sea. 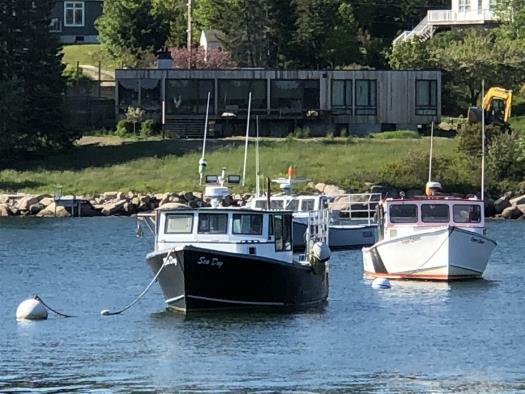 If you are looking for a peaceful, well-kept cottage on the beautiful coast lines of Deer Isle then look no further. Call or inquire for additional information.